"We couldn't be any happier with our puppy and would like to thank you and your organization on the great work you do." to everyone who is supporting rescue; we couldn't have done it without you!!! My wife and I adopted Moose almost four years ago. 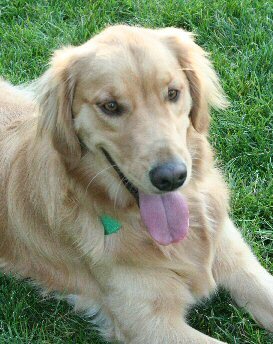 We were looking for a best friend for our other Golden Retriever Sadie. We went to visit the rescue to look at two other dogs, and this giant 120 pound guy comes running out of the pack with a smile on his face and jumped up and almost knocked my wife to the ground. I knew right away that he was the one we needed. So big and happy and full of nothing but love. We were told that he was dropped off at a local pound to be euthanized for being aggressive, but in the time he was with us we never saw a single aggressive bone in his entire body. He loved going to the dog park and ignoring the other dogs, he just wanted attention from anyone that even looked at him. He was never into toys, but he loved playing with the logs in the woodside behind our house. He just wanted to be outside all the time and ignore anyone that talked to him. I'm still convinced he didn't know his own name and he was a jerk most of the time. We loved him for it, it was his personality and I wouldn't have changed a thing about him. Sadly, he was diagnosed with IMHA last week. We did everything we could, he had a blood transfusion and his body rejected it. We had to make the hardest decision of our lives and take our five year old dog to the vet and say goodbye. 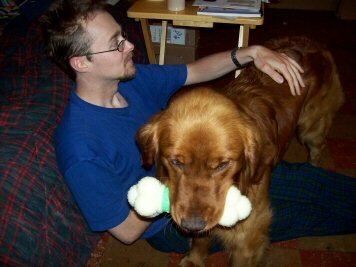 It would take two dogs his size to even try to compare to the love and companionship we were able to get out of him in such a short time. Chief (formally known as Sean) has been a huge blessing in our lives since February 1st, 2014. My husband wanted a bigger dog but I was apprehensive about adding another into our home, especially since I had no previous experience with dogs larger than 15 lbs. My fears were put to rest as he is the most well behaved dog I ever met. I thought Kali was enough for me until I saw Chief on IEGRR. His description was perfect and after recently going through the puppy stage I wanted to introduce an older, calmer dog, who was already potty trained. It was an added bonus that he looked so handsome in his photo! The moment we met him I knew he was ours and the transition into our home was instant. He came to us already knowing how to sit, shake, come and stay. He also does not jump or bark unless we are outside playing. We taught him how to retrieve us his bowl when it�s time to eat and he is doing much better walking on a leash (who says old dogs can�t learn new tricks?). He and our puppy bonded so quickly that they are now inseparable. They love to play tug-of-war where he drags Kali all over the house and we sometimes catch them napping together in his bed. He might be 10 years old, but it is hard to believe! 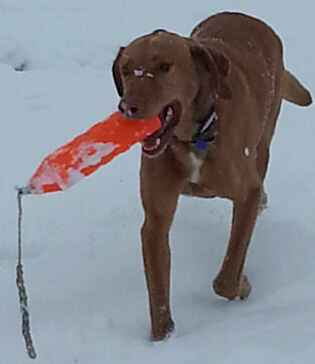 We have a dog park near our home where he runs and retrieves anything we throw over and over again. He adds the last puzzle piece to our family that we didn�t know was missing. 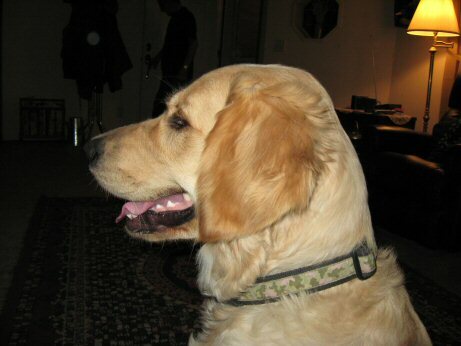 Hi Carol: Here is a picture of Reilly (formerly Otis) rescued from Blanchard, Idaho in October 2010. 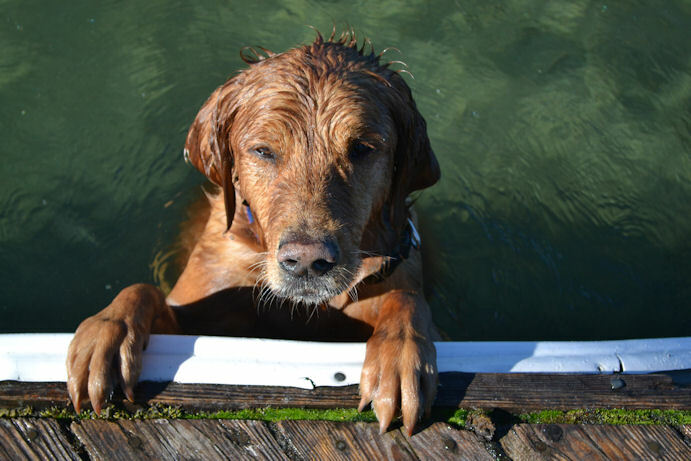 Reilly has since learn to swim in Puget Sound and he is the hit of our new neighborhood. Everybody loves Reilly and he is just a dog full of love. He just wants to be with us no matter where we go. We have a couple of nearby dog parks and he loves socializing with other dogs. We took him on vacation to California and he especially liked the many scents in several national parks. Before Reilly came to us he had been tied to a tree and abandoned. He was a dog that needed to be loved and he shows his love to us and our neighbors everyday. If anyone on your team ever asks if their work is worth the effort, the answer is a BIG YES. Reilly just walks into a room and he makes people smile. During a Thanksgiving dinner for needy families, the pastor of the church providing the meal said to the audience. I was not a big fan of dogs but Reilly is the neatest dog ever. Thanks to the entire team for bringing Reilly into our lives. P.S. On a few rare stops, Reilly gets a vanilla ice cream at McDonalds and it is a hoot to see him licking the ice cream from the plastic cup. People pull up and remark that he is sure enjoying life. best feeling is that we gave him a great home for the time we had him!! we found him. I dare think what would have happened to this most lovable dog had it not been for the Inland Empire Golden Rescue. always be in our hearts and very missed. Thank you for giving us the chance to love him. 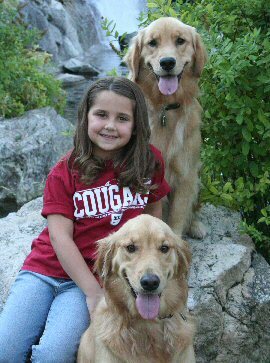 Our family has long been a golden retriever family, starting with two we raised from pups in 1993 & 1994 when my kids were babies too. 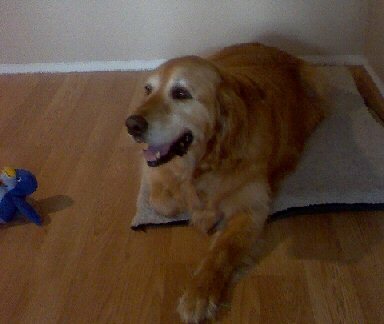 In December 2004, just six weeks after my dad died, our beloved golden, Ranger, succumbed to cancer. Our hearts were broken, being hit with two profound losses within weeks of each other. 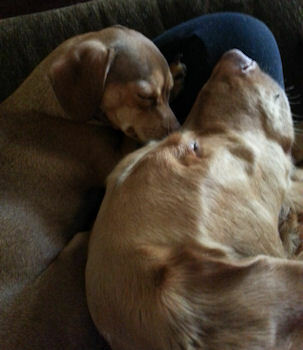 Ranger�s sister died two years before he did, and for the first time ever, we were a dog-less family. A couple of months after we said goodbye to Ranger, I called the IEGRR. Carol Thompson was very empathetic to our recent losses and said she thought she had the perfect fit for our family. His name was Riley, and he had just come in a few days earlier. Riley�s story was as mysterious as it was interesting. He had been picked up by the Post Falls animal shelter as a stray and was claimed by his owner/caregiver shortly thereafter. He was picked up a second time a few weeks later; however, no one came to get him that second time. The shelter knew it was the same dog because Riley had a very distinguishable black diamond-shaped mark on his tongue. (Carol pointed out his mark to us and described him as being a diamond in the rough.) The shelter told Carol they were going to send him to WSU unless she wanted to claim him. We happily brought our new love home and quickly discovered that he was no diamond �in the rough� - rather, he was a fully-polished diamond gem. Riley�s previous owners must have spent a lot of time and/or money in training him. He knew all of the basic commands - sit, stay, come, lay down - and he would walk at heel with or without a leash. He didn�t jump on counter-tops, people, or furniture; and would actually refrain from giving slobbering kisses that is so typical of most dogs. (Once we coaxed our first �kiss� out of him, however, he was cured of that!) He was so incredibly well-behaved that we knew he had obviously been well-loved in his past home and wondered what his true story was. One of our neighbors wondered if maybe his family had been deployed to Iraq and maybe he had gotten away from a temporary caregiver. Whatever his story, it was hard to believe that Riley would run away from any home where he was loved. We never had to worry about him getting out or running away. In fact, one time when the gate was left open after we had left for work and school, he stayed right on the front porch and waited for us the whole day. He was never far from our side. In 2007, we took in a stray black lab named Duke. From the first time they met, Riley and Duke were the best of friends; they played and played and played together�and so our family was complete for the next four years. We never knew exactly how old Riley was when he came to us, but as it turned out, he was several years older than we thought. 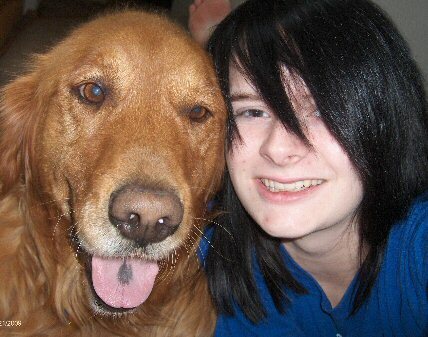 Around December 2010, Riley started feeling his age and began to slow down considerably. We had again suffered a profound loss when my mom passed away two months before in October. It seemed like deja vu all over again. We knew Riley was getting old, but thought the warmth of the coming summer would help keep him around for at least another year. Sadly, that wasn�t the case. 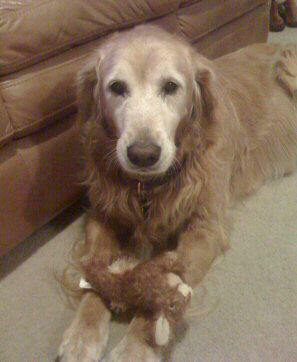 We said goodbye to Riley on March 17, 2011. 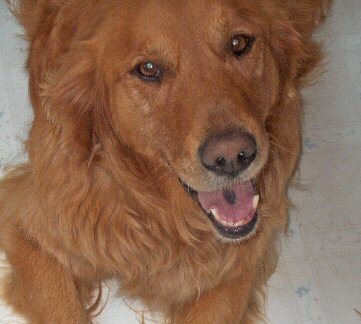 It was heartbreaking - perhaps more so than any other dog I�ve lost. Our Riley puppy brought such joy to our lives. We told him all the time, including up to the moment he slipped away, that he was the best dog ever - and he was! Over the years I have wanted to tell Carol what a good thing she did for us that day in 2005 when she placed Riley with us. But as it happens - life got in the way, and I never made the call or wrote the letter. Today I would like to say thank you, Carol, from the bottom of our hearts for bringing Riley to us. 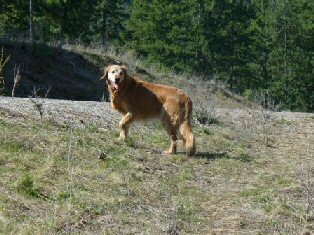 It is clear that Riley�s buddy, Duke, feels the loss of his friend as we do; so it is inevitable that we will be making another call to the IEGRR in the hope of welcoming another golden into our home. 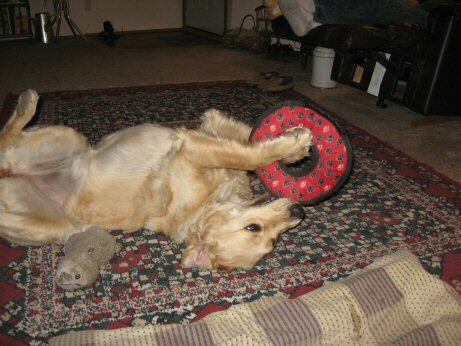 We have had a golden retriever past. we started with Sam. He was not trained and I only knew him for a few years until my parents said he was "going to a farm where he could run and be happy!" He was a violent and wild dog from the pet store. After getting rid of Sam, my parents met with Carol Tompson. Just a few days later, we had Riley. She was about 7 when we got her. 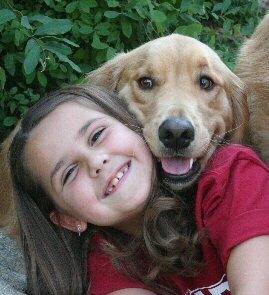 She was the best dog ever! We called her our rug because she would lay around the house all day! She was 11 when we found out that she had cancer. We had to put her to sleep. I thought it was the saddest day of my life. 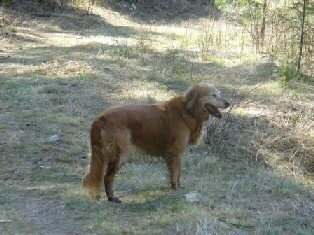 Then my parents talked to Carol again and found that another golden retriever was found just a few hours from our home roaming around, abandoned. Carol brought her to our home, and we knew she was the dog for us! Before adopting her, she had the nickname of Butter. It described her looks inside and out. She was a a year and a half old, younger than Riley, just liked we hoped. We renamed her Sadie. 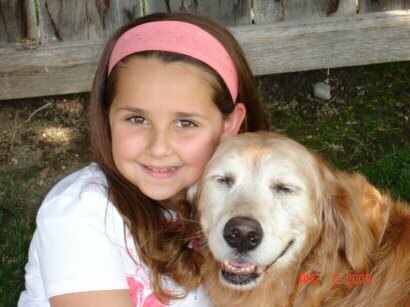 She is still our dog now and I don�t know what I would do without her. She is energetic and sweet. She is four now, and still loving as always. I want to thank Carol for giving Sadie to us, she means everything to our family!!! Thanks Carol! You are the BEST!!!!!!! Hello this is Joey we got him from IEGRR about 7 years ago. He is a very good friend. Just thought I would give you another photo of a very successful adoption. 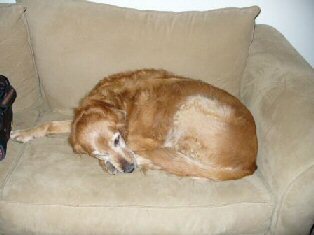 In September 2008 my golden retriever Meggie was 11 years old and seemed to have lost much of her enthusiasm for life. Though healthy, she really seemed to be depressed, sleeping most of the time. 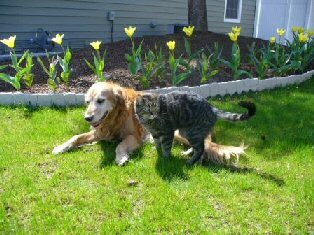 She had been my buddy through thick and thin and I knew I would not want to be �dogless� very long when she went over the �rainbow bridge�, which seemed not far off. 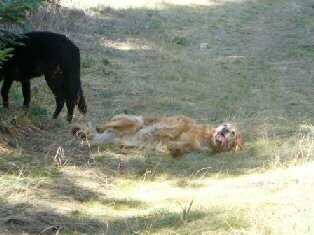 So when I heard about IEGRR and called Carol Tompson I explained I had an old decrepit dog and was calling in preparation for her inevitable, and apparently not too distant departure, when I would then like to get another Golden. Carol visited and vetted me and Meggie at my house and we discussed my wish to get another female, preferably a young one, when Meggie died. Carol mentioned that they almost never got really young dogs. I said I�d call when Meggie died. And that was that. About 3 weeks later Carol called and said they had a 13 week old female for adoption - did I want it? I wasn�t really ready for THAT decision but agreed to �go meet� (yeah, sure�) the puppy - who was described as a �pistol�. Little did I know how accurate that description was (is) and what I was getting into. A few days later after hastily �dog proofing� (I thought) the house I brought �renamed Gloria� home to meet Meggie. Being such a good natured old thing Meggie decided to just ignore �it� since �it� surely would be returned to whoever we were dog-sitting for in a few days. Gloria, having spent a week or so gaining confidence at Carol Thompson�s �IEGRR home for temporarily wayward dogs� was not at all intimidated by Meggie�s lack of interest or her size. Very fascinated by Meggie�s 11 year accumulation of soon-to-be eye-less, nose-less, tail-less stuffed animals. After a few days Meggie began to interact with the new pest and soon they were romping around together and wrestling in the 97 inches of snow we had. Meggie lost weight and gained interest in life. Soon Meggie was acting like a 7 year old dog rather than a 11 year old. It has been fascinating watching Maggie �teach� Gloria, as well as incredibly helpful. Although Gloria thinks she�s the �alpha� dog in their play she carefully watches Meggie to decide how to react to any type of decision situation. Gloria is now approaching 2 years of age and she and Meggie and are best buddies. 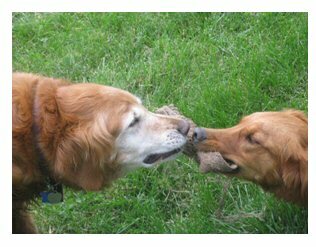 The point is - if you already have a mellow old aging Golden, adopting another Golden may be the best thing you can do for your old dog, the adopted dog, and yourself. I would like to thank Carol and all of the volunteers at IEGRR for placing Emily into our home. I never knew just how much joy adding a dog could bring to our family. 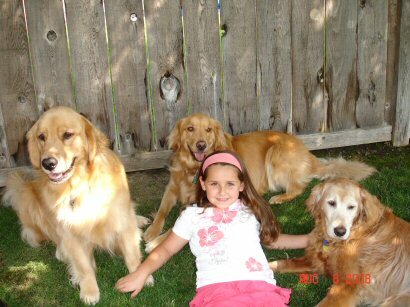 We had wanted a Golden for a number of years, but due to some neighborhood covenants, we were only permitted to install vinyl fences (expensive) so we had put off getting our Golden until we could provide the proper home and care that these wonderful dogs need. After several years of savings, we finally managed to get the yard fenced. So it was off to the rescue to see which bundle of joy we could bring into our lives. Though we were not first time dog owners, we hadn�t had a four legged friend in our lives for the better part of 10 years. Jobs, careers, and the joy of two children, now 8 and 3, delayed the placement of our four legged friend. We did have some considerations, as our youngest is petite for her age and respectfully cautious of something twice her size. Additionally, we are a dual career family (like most folks) and so we were wanting a dog that was beautifully seasoned, easy going to our busy lifestyle, and still youthful and a joy to be around. It is incredible how much our expectations had been far exceeded. She is truly pure old gold. On our first visit to Carol�s, amongst all the usual excitement of meeting a new four legged friend, the family had just walked Blooms Day, so our littlest one was a little tired. That and the rain added wonderful extra elements to our visit to see what type of personalities existed just beyond Carols� garage. We met all types of wonderful Golden�s. My son was set on a �boy dog� for no other reason than �girls are yucky.� My daughter started to have second thoughts and frankly was over-stimulated and just wanted to go home, but someone caught our eye, and her name was Emily, age 8. Sweet, petite, and demure and with a look of uncertainty in her eye, she suddenly moved to the top of our list. Yes, she was a girl and that meant compromise with our son, but with such the sweetest disposition and mellow temperament, she was certainly one for us to talk about on our way home. My son was voting for a �boy dog.� Over the next several days, we all had our say and talked about which dog would be the one for our family. After some negotiation that would make a lawyer proud, my son managed to negotiate the purchase of all the new items for Emily, leashes, bowls, toys, etc. There was still some cautious considerations, so we set up a follow up visit the next weekend, thus allowing our youngest a chance to interact with Emily when our youngest wasn�t so over whelmed and when we could all go for a nice walk in the neighborhood. Emily came home with us after a pleasant walk at Carol�s for a �let�s see weekend.� The trip home included a walk through Petsmart, where everybody complimented us on Emily�s good manners and beauty. By Sunday night (yes, just 24 hours later) we knew right away that she was �ours� and that there would be no way she could ever leave our home. That wonderful bundle of joy, adopted us just as much as we adopted her. She was sweet, polite, well behaved, and knew all the commands of sit, stay, down, and shake. All of the wonderful good citizen things that a family could have hoped for, our Emily already had. Her personality has blossomed and flourished since being in our home which has allowed our youngest to say �look Daddy, I�m giving Emily a hug.� Emily has been such a wonderful treat, has blended into our family and lifestyle so smoothly and effortlessly, that we are pinching ourselves to see if this is real. She is gentle on the leash with no pulls or tugs, walks by your side, has greeted every dog in the neighborhood with a sniff and a bark and has been such a joy to have at our side. She loves all the hugs, belly rubs, and attention. She loves the water and bathes beautifully. She has come out of her semi-timid shell, and now when she goes for a �walkie walk� her front paws are down her rear is high in the air and her tail is a wagging machine. Oh by the way, she even potty�s when told. She is just unbelievable. 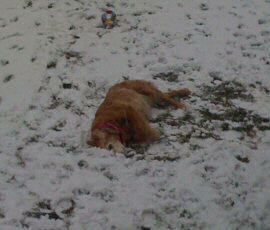 Two of my neighbors (coincidentally) are also IEGRR adoptive parents and Emily gets along great with those dogs as well. We could almost have our own little rescue reunion, from Carols capable and loving hands, to our loving and forever homes. I understand the decision to surrender is often a difficult and troublesome one for many, as life is full of twists and turns, but we are so thankful that Emily is part of our lives now. Though it has only been a short time since Emily has joined our family, she is just loving all the love, attention, and play that the whole family is providing. I can not say enough how wonderful this dog is and how much love she has brought to our home. She enjoys her morning and evening walks and is always there at the door to greet us with a wagging tail when we get home. A great big thank you goes out to Carol and all the volunteers at IEGRR for all of your hard work and tireless efforts. Emily has found a wonderful home, full of children, happiness, and plenty of opportunities to play and get love and affection from everybody, even the neighborhood kids. All the kids at the Elementary school when our 8 year old gets picked up, run over and give �Emily� a pat and a rub and say how beautiful she is. And there�s Emily, all smiles and loving all the attention she so richly deserves. March 7th, 2009. Tomorrow will be the day I meet up with Carol Tompson. I've never met her yet...except for over the phone. What a remarkable lady. She however, remembers talking to me. We've had alot of conversations over the phone during the last 8 or 9 months. That's how long it's taken me to finally come to grips that our two Golden pure-breds might be better off with families that can give them all the love that golden's deserve. We bought our 1st pure-bred back in 2000. The second one came along after we rescued her from a relative who could no longer care for her. They're both the same age so it's been a fun ride. But I had been struggling with this decision for a long time because I felt so guilty for feeling like I may be "abandoning" them and handing them over to an organization (or anybody for that matter) that I knew little about. I hadn't known that they even had a website until right this minute when I got off the phone with carol to confirm our appointment for tomorrow. And even though I played the game of assuring Carol (myself really) that I was making the right decision and that this time I was for sure going to go through with my plans of giving them up for adoption, I was still having doubts. Today I spent my day just with them since my wife's out of town visiting our immediate family. I had been deliberating all day long whether or not I was going to go through with this or not. I began by taking them to the dog park out at State Line (which is free & is a great place for them to run with other dogs). Then I took them for walks out in our field at our rental house that we're currently in. I later took them to the grocery store, where I got them some chew bones and round steaks. Went for more walks. Brushed them each for about an hour. Gave them each a bath. Generally...just spent the day with them. You see, my wife and I have been struggling with this decision because we love them so much, but with a new grandbaby & family 450 miles away and working full-time and starting a business that will hopefully put us nearer to our grandbaby, I've always felt guilty for just spending so little time with "the girls". Still deliberating up until this evening, I decided to check out the website. And that's when I found all of "you". "You" are all the other Golden retriever lovers that I never knew existed. I wanna say "thanks" to you all. It wasn't until I read all of your happy stories with tears streaming down my face that I knew I was making the right decision for our girls. (I know call me a softy). My wife and I were never able to have kids either so maybe that's my explanation for being so close to our dogs. I have to say that they are for sure happy tears though. I guess you just can't take the kid out of a real grown man. If a young boy grows up with a good ol' "fuzzhead" as his childhood companion, there's something special that lives on in us forever I guess. I don't know whether or not the two of them will wind up in the same homes. But it really wouldn't matter after reading all the stories of how well the dogs seem to adjust to all their new homes and how much all the new owners love, care for, & respect their new companions. It seems like there's an exact match out there in the works of always happening. We weren't going to be around hardly at all with our new schedules. And I already knew they weren't getting the attention that goldens need. So, to all of you who have given your dog (of all ages) new homes, thank you. And thank you so much for posting your stories here. For owners in my situation, that means everything. It's been a mental up and down struggle for many months. And now I know for sure that "our girls" are going to be given a special home. 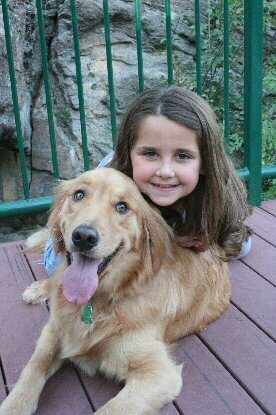 On June 29, 2008 our family went to visit Carol Tompson at her home to drop off some dog food, toys and treats that our 9 year old daughter, Mikaylie, wanted to donate to the Golden Retriever Rescue. It had been over a year since we had adopted Brody (seen below in the success story) and since that time, all Mikaylie ever talked about was her dogs and how all golden retrievers needed a good home. 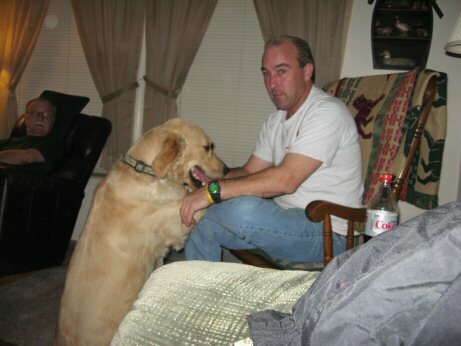 When we got to Carol�s house we met all the dogs at that time that lived with Carol. It was a wonderful experience for Mikaylie, because she got to play and spend some quality time with them. But there was one dog in particular that touched all of our hearts. Her name was Penny. Penny is an 11 year old senior, and her face and body language were evident of her age. She seemed so sad, but there was something about the way she looked at us and put her paw and then her chin on all of our laps. It was as if she knew we were there to take her home. As we were leaving, there was just something about Penny that we could not get out of our minds. Maybe it was her eyes, her sweet, yet sad demeanor that made us all discuss her in the car ride home. 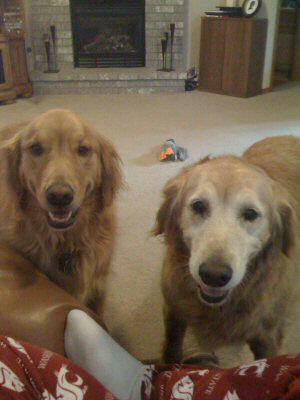 When we went to Carol�s we had no intention of adopting another golden retriever, especially a senior dog. We already had 2 that were two years old and full of energy! Plus, our pets are our family, so the thought of taking on an 11 year old senior who may not have a lot of life left in her, was hard to fathom. But it was our daughter who kept telling us, that even if she only lived with us for a few months, it was better to give her love for 2 months then no love at all. It was hard to argue with that! So the next week, Penny came to live with us. She had to have surgery, which was hard, because she was going from several different homes, to surgery, and then back to our house. She didn�t know who to trust. It took her several weeks to finally realize that we were her new family. At first, she wouldn�t really act excited when we came home at the end of the day. 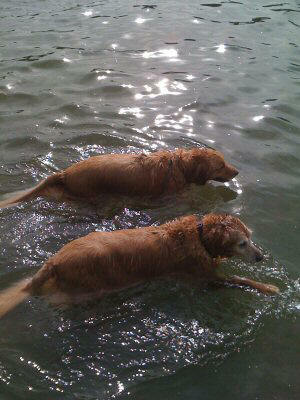 But now, she does the exact same thing as Izzie and Brody, our other two golden�s. She starts hopping on her front legs, searches the floor for something to pick up, crinkles her ears and talks to us as we are coming through the door. She never leaves our side and always needs to be touching us in some way, I suppose to make sure that we are going to stay with her. Since Penny joined our family we have seen her grow younger every day! She loves to go on walks, go in the car for �coffee� runs, play with her stuffed animals, play fetch and she even went swimming for the first time and seemed to enjoy it after the first shock of figuring out how to swim. We just experienced our first snowfall of the year with Penny, and it was obvious by the way she rolled around and made dog angels that she enjoyed the snow. We realize that we may not have the privilege of having Penny in our lives for a long time, but the days that we do have with her make everything worth it. 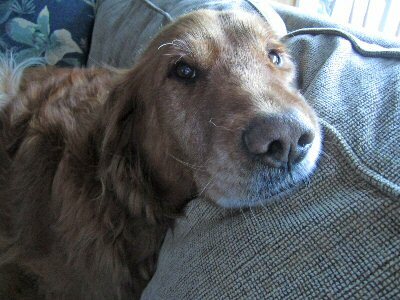 We never thought adopting a senior dog would be such a rewarding experience. She has brought so much joy to all of our lives and has become a wonderful companion for our daughter. It is obvious that she has fallen in love with her new family, just as we have fallen in love with her. Thank you to Carol Tompson and the Golden Retriever Rescue for all that you do. Originally we decided to adopt Penny because she was a senior dog who we felt deserved to live a happy life with a family who would love her and appreciate her. But it is our family who has really benefited by having Penny. She has given us so much more in return, more then we could ever give her, with her big heart and joyous attitude. She always makes us smile. the game stops while she rests. The pups are waiting patiently for the ball to be thrown again! Penny with her favorite toy. She always sleeps with her bunny and packs it around. Penny and Mikaylie. Penny always looks like she is smiling! Hi, we are Jim and Carol. We lost out old Golden mix in March. 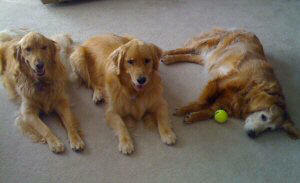 There was such a void in our lives that we knew we had to fill with another Golden. After talking to Carol and telling her our needs, our son drove me to see Molly. I knew when I seen her my husband would not get her because she was alot bigger then our other dog . But my son fell in love with her as she looked so much like the dog he use to have. So surprise, we brought her home. My husband wasn't sure at first when we got her home. That was April 1st 2008. He has since changed his mind and loves her. She loves to ride, loves our granddaughter, gets along good with the neighbor kids. Everything we wanted. She will give you five when you give her a treat. She loves playing with her toys and once a week we take her to play with our sons dogs. She loves running with his 2year old Lab. And she loved playing in the wading pool with his Lab. We are so glad we gave her a chance at having a forever home. 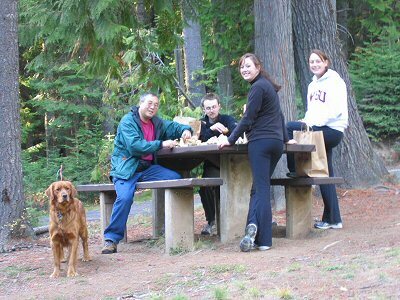 We moved to the Pacific Northwest in the summer of 2007 leaving behind our family and friends on the East Coast. Jeff and I quickly settled in made new friends and began to explore the Palouse and Northern Idaho. We bought our first house at the end of 2007 and realized we had the space and stability to be dog owners. 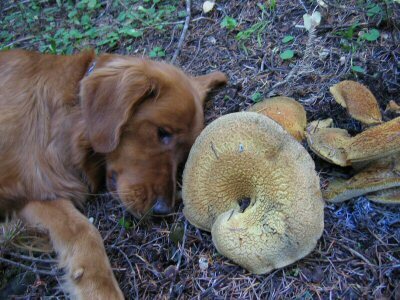 We wanted a fairly active but good natured dog that could go on hikes and mushroom hunt with us and our new friends. Jeffʼs aunt had a fabulous golden retriever when he was growing up and was sold on the idea of adopting a golden. 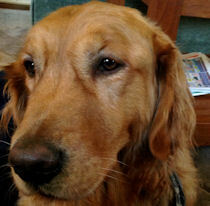 He contacted Inland Empire Golden Retriever Rescue and we drove to Spokane to hopefully meet our new best friend. We were introduced to Chipper our golden retriever. He immediately stood up on his back legs and gave Jeff a hug and licked his face. Chipper was found on the side of the road nearly dead but was and still is a trusting little guy. His prior trauma appears to have been forgotten. He is happy and well adjusted. He loves everybody, human and animal. One of our cats hangs out with him on a regular basis. He is in dog obedience and appears to have the potential for agility training. Most recently, he helped me pass out Halloween candy to local children. 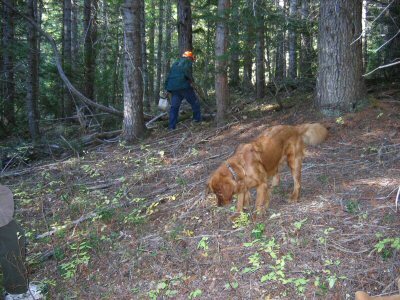 Below are some pictures of Chipper mushroom hunting and playing with Jeff. We are so pleased to have Chipper. 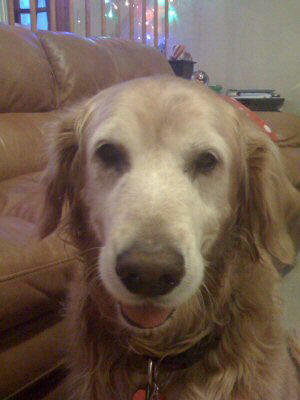 Jeff and I would like to thank Carol in particular and Inland Empire Golden Retriever Rescue for saving our dog Chip. 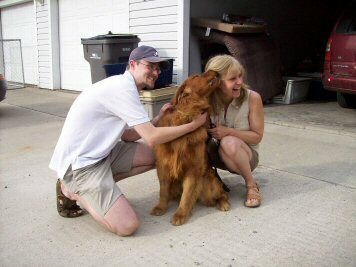 March 2007 was a special time for our family� it was the month we adopted our golden retriever, Brody. We had already fallen in love with the breed after we bought our first golden, Izzie, from a local breeder. After a year we knew that we would like to add another golden to our family, so we looked into the golden retriever rescue. Knowing how difficult it was to find a puppy a year before, we assumed that we would have a long wait as we were looking to adopt a golden. But the big call came in just a few weeks after we had sent out paperwork in from Carol, who told us that she thought she had found the perfect dog. His name was Brody and he was a year old male with all his paperwork. Of course we were surprised at how quickly the call came in, but we excited at the possibility. So, a few days later Carol brought Brody to our home. I will never forget the day. It was rainy and as Brody walked up the walkway to our home, I couldn�t believe how much he looked like our Izzie. When he came into our home, we was a little nervous, but was willing to come and see our golden Izzie and our 7 year old daughter Mikaylie. He was perfect! We knew right away that he would become a member of our family. After looking at his paperwork, we noticed that he was actually a cousin of our golden Izzie� small world! After the first night, we were ready to make the commitment to adopt Brody. We had all fallen in love with him. He was so different, yet so similar in mannerism as our current golden Izzie. On his second day in our home we took him to get a bath at Yuppy Puppy. He was in terrible shape� very thin and his hair was so matted that it was pulling at his skin. While getting his bath, he actually laid down in the tub and fell asleep. We could not believe how well mannered he was and how much he trusted us as his new owners. It has been almost a year now, and we can�t imagine our lives without Brody. He is a playful, sweet and a well mannered boy. 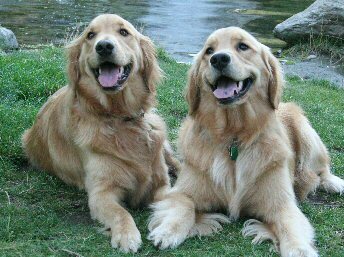 Watching our two golden�s play with each other is our favorite past time, especially when they are running or swimming with our daughter. 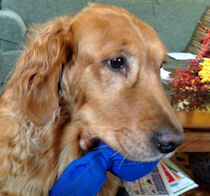 Brody loves to swim and catch bugs, chase birds and play with stuffed animals. He is also a huge fan of Animal Planet! 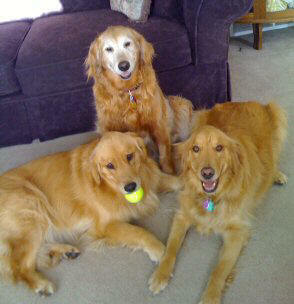 The inland empire golden retriever rescue is a wonderful organization. We feel so lucky to have received Brody. We commend everyone who works to find these wonderful dogs loving homes where they can excel as members of their families. We thank you for helping us find Brody�. A true friend, a true companion. say, was history. Goldie has brought tons of joy to me and my other animals. tale. Here are some current pictures of my darling.